Resident Evil: The Final Chapter is a 2016 science fiction action film written and directed by Paul W. S. Anderson. A direct sequel to Resident Evil: Retribution (2012), it is the sixth and final installment in the Resident Evil film series, which is loosely based on the video game series of the same name. The film stars Milla Jovovich, Ali Larter, Shawn Roberts, Ruby Rose, Eoin Macken, William Levy and Iain Glen. In the film, Alice and her friends are betrayed by Albert Wesker, who gathers the entire forces of Umbrella into one final strike against the apocalypse survivors. Resident Evil: The Final Chapter was released on December 23, 2016, in Japan and on January 27, 2017, in the United States in 2D, 3D and IMAX 3D. The film received mixed reviews and became the highest-grossing film in the franchise, earning over $312 million worldwide. Dr. James Marcus, founder of the Umbrella Corporation, had a daughter who was dying of premature aging. Desperate to save her, Marcus discovered the T-virus. The virus had the side effect of sudden and uncontrollable mutation; a boy died in a cable car ascending to Table Mountain, then reanimated and killed the other passengers. When Marcus tried to have the program shut down, his colleague, Dr. Alexander Isaacs, ordered Albert Wesker to kill him. Isaacs created the Red Queen avatar using images of Marcus' daughter. After the events in Washington D.C., Alice awakens after being betrayed once again by Wesker. The Red Queen appears and tells Alice she has 48 hours to infiltrate the Hive, over 400 miles west on I-64 in Raccoon City. The Umbrella Corporation has developed an airborne anti-virus, which can kill every organism infected by the T-virus, but is waiting for the last few thousand humans to be wiped out. En route to Raccoon City, Alice is captured by Isaacs—learning the one she previously killed was a clone. She eventually escapes his convoy and reaches Raccoon City, where she is ambushed by a group of survivors: Doc, Abigail, Christian, Cobalt, Razor, and Claire Redfield, who survived the attack on Arcadia. Isaacs' convoy approaches, trailed by a horde of zombies. Alice and the group defeat the convoy, retrieve Isaacs' few human captives and burn the horde, though Cobalt is killed. Alice and crew enter the Hive entrance, at the bottom of the crater from the nuclear bomb previously dropped on the city. Wesker, in control of the Hive, releases mutated guard dogs, killing Christian and a freed captive. The Red Queen appears to Alice and explains that her program is in conflict, as she can never hurt an Umbrella employee but also must value human life. She plays a video of Isaacs explaining to Umbrella's executives a plan to release the T-virus, cleansing the world of humanity and its tendency of causing destructive catastrophes; many of the rich and powerful, including the company executives, are stored in cryogenic capsules in the Hive, with the intention of them rebuilding the world following the resulting apocalypse. The Red Queen warns Alice that someone in her group is helping Umbrella. The group encounter several traps, killing Abigail and Razor. Alice and Doc plant bombs throughout the Hive, from the leftover equipment of the original team to investigate the Hive. Alice confronts the real, tech-upgraded, Isaacs. Doc is revealed to be Umbrella's spy, and Claire is captured by Wesker. A cryogenic capsule opens, releasing Alicia Marcus, Umbrella's co-owner and Marcus' daughter. Isaacs reveals to Alice that she is actually a clone of Alicia, before going on to explain his plan to eliminate the pair and assume control of Umbrella. Alicia fires Wesker, allowing the Red Queen to crush his legs with a security door. Doc tries to shoot Alice, but his gun is empty—-as Alice had earlier deduced his treachery—-and Claire executes him. After giving Wesker a deadman's switch to the primed bombs, Alice and Claire pursue Isaacs while Alicia uploads a copy of her childhood memories. Isaacs, Alice and Claire fight; Isaacs overpowers Claire and attacks Alice in the Laser Corridor, eventually defeating her, but she uses that moment to activate a grenade in his pocket. She escapes to the surface with the anti-virus, but Isaacs reboots and catches her before she can release it. Before he can kill her, the Isaacs clone (from the convoy) arrives and kills him, but the clone is then devoured by the undead. Alice releases the anti-virus, killing all of the undead around her before she passes out. Wesker simultaneously drops the deadman's switch, destroying himself, Alicia, the Hive and the hibernating Umbrella elite. Claire wakes Alice, who survived because the anti-virus killed only the T-virus within her body, not the healthy cells. The Red Queen uploads Alicia’s childhood memories into Alice, granting her a childhood. Alice travels into Manhattan, saying that the anti-virus, carried only by the winds, will take years to reach all corners of the globe, and until it does, her mission is not finished. Milla Jovovich as Alice, former Umbrella security officer-turned-resistance fighter, who had been captured by Umbrella scientists after the original Hive contamination and experimented on. Ten years after Raccoon City is destroyed and the virus has spread across the globe, she has bonded with the virus on a cellular level, giving her superhuman ability since a previous encounter with Albert Wesker. She continues her vengeance against Umbrella for the death of her allies and the catastrophe they have caused. She is revealed to be the last of many Alice clones created by Umbrella. Jovovich also plays the role of the older Alicia Marcus, daughter of the creator of the T-Virus, co-owner (from her father's share) of the Umbrella Corporation and the source from whom the Alices were cloned. Iain Glen as Dr. Alexander Isaacs (and one clone), the technologically enhanced CEO of the Umbrella Corporation previously thought to have been killed by Alice (it was a clone). He maniacally intended to use the T-Virus to start a biblical apocalypse, wiping out most of humanity and leaving a few tens of thousands alive, so as to remake the world with Umbrella's designs. Ali Larter as Claire Redfield, one of Alice's closest allies, formerly led the convoy of survivors in the Nevada desert, and had gone missing along with her brother, Chris Redfield, after Umbrella's assault on Arcadia. She joins Alice and the others on the mission to the Hive to defeat Isaacs. Shawn Roberts as Albert Wesker, the former chairman of Umbrella who is the personal subordinate of Dr. Isaacs, and is also the mastermind of the plot which has betrayed Alice once again after the events of the previous film. After the Red Queen slammed a door that amputated his legs, Alice gives him the deadman's trigger to bombs she has planted inside the Hive - allowing her and Claire to escape as he slowly passes out from blood loss. Eoin Macken as Doc, a spy working for Umbrella, posing as one of the survivors as assigned by Isaacs to find Alice. Fraser James as Razor, a survivor who aids Alice and the others into the Hive. Ruby Rose as Abigail, an inmate survivor who also joins Alice's attack into the Hive. Rola as Cobalt, a survivor who joins the assault on Umbrella. Ever Gabo Anderson as Red Queen, the artificial intelligence created by Umbrella, and also one of Alice's former enemy, now turned rogue. Unable to act directly against Umbrella employees, but recognizing her role in the fate of humanity, Red Queen gives information to Alice in order to help release the antivirus and defeat Isaacs. Anderson also plays the young Alicia Marcus. Lee Joon-gi as Commander Chu, Umbrella's security chief and second-in-command. Ever Gabo Anderson, who plays Young Alicia/Red Queen, is the daughter of Jovovich and Paul W. S. Anderson, the film's writer/director. In September 2012, following the box office success of Resident Evil: Retribution, a sixth film in the "Resident Evil" series was confirmed by the head of Sony Pictures distribution, Rory Bruer, with Milla Jovovich attached to reprise the role of Alice. In October 2012, in an interview with Forbes, producer Samuel Hadida stated that a sixth and seventh installment were being planned and a reboot of the series was possible. In December 2012, director Paul W. S. Anderson confirmed that he would be directing "Resident Evil 6". He stated that it would be the last film in the series and some characters from the first two films would return. In June 2013, Jovovich tweeted that the sixth film, which had been scheduled for a September 12, 2014, release, would not be released before 2015. The film was scheduled to start shooting in late 2013 as soon as Anderson had finished work on his disaster/romance film Pompeii. In February 2014, Anderson told Collider that "we'd like to do another Resident Evil movie. Definitely. But the wheels aren't quite in motion yet,"; the film was reportedly planned to be released in 2015. In April 2014, while speaking at the Beijing International Film Festival, Anderson revealed that he would soon be writing the screenplay for the sixth film in the series. He also confirmed that the film would be in 3D and that actress Li Bingbing would be returning to play Ada Wong. 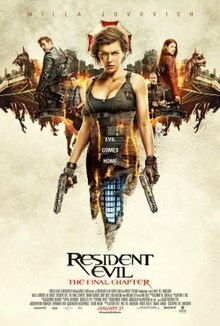 In June 2014, Anderson announced the film's working title to be "Resident Evil: The Final Chapter" and confirmed that it was intended to be the final film in the series. He also revealed that half the script had been completed, but, as yet, there were no shooting or release schedules. Filming was set to begin in South Africa in August 2014 but was delayed for a year because of Jovovich's pregnancy. On July 15, 2015, Jovovich posted a photo on Instagram announcing that shooting was about to start in South Africa. Actors from previous films: Sienna Guillory (Jill Valentine), Li Bingbing (Ada Wong), Aryana Engineer (Becky), Spencer Locke (K-Mart), Michelle Rodriguez (Rain Ocampo), Wentworth Miller (Chris Redfield), and Johann Urb (Leon S. Kennedy) were not invited to return for the last movie. On August 3, 2015, it was confirmed that Ali Larter would be back for the sequel in the role of Claire Redfield, and filming would begin in late August or early September. Larter confirmed the sixth film would be the last in the franchise. On September 18, 2015, other cast members were announced including Iain Glen as Dr. Alexander Isaacs, Shawn Roberts as Albert Wesker, Ruby Rose as Abigail, Eoin Macken as Doc, William Levy as Christian, Fraser James as Michael, and Rola as Cobalt. On October 19, 2015, Lee Joon-gi joined the film to play Commander Lee of the Umbrella Corporation. Japanese rock band L'Arc-en-Ciel created the song "Don't Be Afraid" specifically for the Japanese theatrical release. Principal photography on the film began on September 18, 2015, in Cape Town / Hartbeespoort Dam, South Africa. During filming, Jovovich's stunt double, British stunt-woman Olivia Jackson, was severely injured when her motorcycle collided with a camera crane, leaving her in a medically-induced coma for two weeks. She had been riding at high speed without a helmet, leading to the accident ripping off half her face, and crushing her facial bones. Among Jackson's injuries were cerebral trauma, a crushed face, a severed artery in her neck, a paralyzed arm, several broken ribs, a shattered scapula, a broken clavicle, torn fingers with a thumb that needed to be amputated, and five nerves torn out of her spinal cord. The camera crane had malfunctioned and failed to move out of the way. Jackson announced in December 2015 that her paralyzed left arm will need to be amputated. Her arm was amputated above the elbow. A second accident occurred during filming on December 3 when crew member Ricardo Cornelius was crushed to death by one of the film's props, a US Army-issue Hummer, while on set. The Hummer was placed on a rotating platform, and fell off, crushing Cornelius, who was assisting with the scene, against a wall. He later died in hospital. Filming ended on December 9, 2015. According to Paul W. S. Anderson, the director, Resident Evil: The Final Chapter was fully shot with 2D cameras and post-converted to 3D by the company: Legend 3D. It's the first time that a movie from the Resident Evil saga has a 3D post-conversion, since the last two installments were shot in 3D. Sony first scheduled the film for release on September 12, 2014 before delaying it over two years. The film was released in Japan on December 23, 2016, and in North America on January 27, 2017, by Screen Gems. Resident Evil: The Final Chapter grossed $26.8 million in the United States and Canada and $285.4 million in other territories for a worldwide total of $312.2 million, against a production budget of $40 million. In North America, the film was released alongside A Dog's Purpose and Gold, and was projected to gross around $13 million from 3,050 theaters in its opening weekend. It made $1 million from Thursday night previews and $5.1 million on its first day. It ended up opening to $13.9 million, the lowest debut of the franchise, and finished 4th at the box office. Despite the film being trimmed by 7 minutes, totaling only 99 minutes, likely thanks to the violence-intolerant State Administration of Press, Publication, Radio, Film and Television, the film opened on February 24, 2017, in China across 11,000 screens, earning $30 million on its opening day. Through its opening weekend, the film made 636.9 million yuan ($92.7 million). This marks the biggest Friday-through-Sunday debut ever for an imported film, topping such heavyweights as Transformers: Age of Extinction (632 million yuan) and Captain America: Civil War (628 million yuan) and the second-biggest for all films, behind only Lost in Thailand. However, figures varied slightly by different outlets—Shanghai-based cinema consulting firm Artisan Gateway had its opening weekend at $93.9 million while the film's studio, Sony Pictures came in even higher with $94.3 million. Mainland China eventually is the movie's best-grossing foreign market, contributing $160 million in box office. Resident Evil: The Final Chapter received mixed reviews from critics. On review aggregator website Rotten Tomatoes, the film has an approval rating of 36% based on 91 reviews, and an average rating of 4.5/10. The website's critical consensus reads, "Resident Evil: The Final Chapter may prove mind-numbingly chaotic for the unconverted, but for fans of the venerable franchise, it offers a fittingly kinetic conclusion to its violent post-apocalyptic saga". On Metacritic the film has a score 49 out of 100, based on 19 critics, indicating "mixed or average reviews". Audiences polled by CinemaScore gave the film an average grade of "B" on an A+ to F scale. Alex Welch of IGN was critical of the film, giving 3/10 and calling it "a pointless mess from beginning to end", and "nothing more than a barrage of cliched character beats, unbearable CGI action, and headache-inducing editing". Glenn Kenny for The New York Times writes, "This is, I think, the weakest picture in the franchise". The decision not to bring back surviving characters from the previous films - notably Jill, Leon and Ada - was a particular draw for criticism, with many voicing disappointment over a lack of closure for said characters and a sense of anti-climax following the cliff-hanger ending of the previous movie that had implied their inclusion in a follow-up. In contrast, Bill Zwecker of Chicago Sun-Times gave the film 3 stars out of 4, saying it "[gets] the storyline right off the bat". He adds, "For fans of Resident Evil, I believe this final film will not disappoint, but it also will likely encourage newcomers to the saga to go back and play a bit of catch-up by watching the earlier movies". Resident Evil: The Final Chapter was released to DVD and Blu-ray on May 16, 2017 in the United States. ^ "Resident Evil: The Final Chapter [2D] (15)". British Board of Film Classification. December 2, 2016. Retrieved December 2, 2016. ^ a b c d e "Resident Evil: The Final Chapter (2017)". AllMovie. Retrieved January 30, 2017. ^ "Resident Evil The Final Chapter (2017)". bfi.org. British Film Institute. ^ a b "Box Office: Can 'A Dog's Purpose' Still Win the Weekend After Canine Controversy?". Variety. Retrieved January 24, 2017. ^ a b c "Resident Evil: The Final Chapter (2017)". Box Office Mojo. Retrieved March 26, 2017. ^ "'Final' Live-Action Resident Evil Film Opens First in Japan on December 23". Anime News Network. April 26, 2016. Retrieved December 3, 2016. ^ a b "Resident Evil: The Final Chapter Review Roundup". WWG.com. Retrieved January 29, 2017. ^ a b c d e f g h i j k "Resident Evil: The Final Chapter Cast Revealed". ComingSoon.net. September 18, 2015. Retrieved September 20, 2015. ^ "'Resident Evil: The Final Chapter". Sony Pictures. Retrieved January 4, 2017. ^ "'Resident Evil: Milla Jovovich reveals her daughter plays new Red Queen". Entertainment Weekly. Retrieved January 4, 2017. ^ Stewart, Andrew (September 21, 2012). "'Evil' sequel plays well overseas". Variety. Retrieved September 26, 2015. ^ Gaudiosi, John (October 29, 2012). "Silent Hill Sequel Bombs At Box Office, Producer Promises More Resident Evil Movies". Forbes. Retrieved September 26, 2015. ^ Alan Orange, B. (December 21, 2012). "EXCLUSIVE: Paul W.S. Anderson Confirms 'Resident Evil 6' Will End the Franchise". MovieWeb. Retrieved September 26, 2015. ^ Barton, Steve (June 19, 2013). "No New Resident Evil Movie Until 2015?". Dread Central. Retrieved September 26, 2015. ^ Wakelin, Simon (June 19, 2013). "Paul W.S. Anderson on filming Pompeii in Toronto". Toronto Star. Retrieved September 26, 2015. ^ Weintraub, Steve (February 1, 2014). "RESIDENT EVIL 6 Update: No Release Date. No Script. But Director Paul W.S. Anderson and Screen Gems Want to Make it". Collider. Retrieved September 26, 2015. ^ "Paul W.S. Anderson Updates on Resident Evil 6, Confirms Returning Cast Member". ComingSoon.net. April 21, 2014. Retrieved September 26, 2015. ^ Chitwood, Adam (June 16, 2014). "Exclusive RESIDENT EVIL 6 Updates: Tentatively Titled RESIDENT EVIL: THE FINAL CHAPTER, Planned as the Last Film, and First Draft Is Currently Being Written". Collider.com. Retrieved September 26, 2015. ^ Perry, Spencer (August 18, 2014). "Resident Evil: Final Chapter Delayed as Milla Jovovich Reveals Second Pregnancy". SuperHeroHype.com. Retrieved August 19, 2014. ^ "Milla Jovovich – So the countdown to our new baby begins,..." Facebook. ^ Lesnick, Silas (July 15, 2015). "Resident Evil: The Final Chapter is Gearing Up!". ComingSoon.net. Retrieved July 16, 2015. ^ Fleming Jr, Mike (August 3, 2015). "'Resident Evil' Sets Ali Larter To Reprise Opposite Milla Jovovich". Deadline Hollywood. Retrieved August 4, 2015. ^ Collura, Scott (August 14, 2015). "Ali Larter Says Resident Evil 6 Really Is the Final Chapter of the Movie Series". IGN. Retrieved August 18, 2015. ^ Hyo-won, Lee (October 19, 2015). "South Korean Star Lee Joon-gi Cast in 'Resident Evil: The Final Chapter'". The Hollywood Reporter. Retrieved October 29, 2015. ^ "L'Arc-en-Ciel Provides Theme Song for "Resident Evil: The Final Chapter" Japanese Dub Edition". ^ Ni Nyoman Wira (September 16, 2016). "L'Arc~en~Ciel to release new song for 'Resident Evil'". The Jakarta Post. Retrieved September 16, 2016. ^ Butler, Karen (September 20, 2015). "'Resident Evil: The Final Chapter' starts filming in South Africa". United Press International. Retrieved September 21, 2015. ^ a b Maryse Godden (October 3, 2016). "'FEELING DOWN WON'T MAKE MY ARM GROW BACK' Stuntwoman who lost limb in horror bike accident on film set opens up about her life-changing injuries". The Sun (London). ^ Robb, David; Busch, Anita (October 13, 2015). "'Resident Evil' Stuntwoman Injured On Set Out Of Coma – Update". Deadline Hollywood. Retrieved October 21, 2015. ^ Wareing, Charlotte (December 21, 2015). "Star Wars Stunt Double Reveals She Will Lose an Arm After Horrific Accident on Resident Evil Set". Daily Mirror. Retrieved January 17, 2016. ^ "Cape man dies on Hollywood movie set". ComingSoon.net. December 17, 2015. Retrieved December 25, 2015. ^ "Crew member crushed to death on Resident Evil: The Final Chapter set". The Daily Telegraph. December 24, 2015. Retrieved January 17, 2016. ^ Sarah Malm (December 24, 2015). "Resident Evil crew member is crushed to death by Hummer falling on top of him - days after stuntwoman revealed she will have left arm amputated following on-set accident". The Daily Mail (London). ^ Perry, Spencer (December 9, 2015). "Production Wraps on Resident Evil: The Final Chapter, More Photos Debut". ComingSoon.net. Retrieved December 10, 2015. ^ Turek, Ryan (March 5, 2013). "Sony Sets a Release Date for Resident Evil 6". ComingSoon.net. Retrieved January 22, 2017. ^ Kroll, Justin (August 5, 2015). "Sony Dates 16 Films Including Two More 'Bad Boys' Sequels, 'Jumanji' Remake". Variety. Retrieved September 20, 2015. ^ Fergus, Ryan. "China Censors Slash Resident Evil Final Chapter". China Film Insider. Retrieved June 11, 2017. ^ a b Jonathan Papish (February 28, 2017). "China Box Office: Evil Takes Up Residence, Sets New Precedent". China Film Insider. Retrieved March 2, 2017. ^ "Resident Evil: Final Chapter (2017) Foreign Gross". BoxOfficeMojo.com. Retrieved June 11, 2017. ^ "Resident Evil: The Final Chapter (2017)". Rotten Tomatoes. Fandango Media. Retrieved April 10, 2018. ^ "Resident Evil: The Final Chapter Reviews". Metacritic. CBS Interactive. Retrieved January 1, 2017. ^ Welch, Alex (January 27, 2017). "Resident Evil: The Final Chapter Review". IGN. Retrieved January 27, 2017. ^ Kenny Glenn, Glenn (January 26, 2017). "Review: Alice Returns in 'Resident Evil: The Final Chapter'". The New York Times. Retrieved January 27, 2017. ^ "Resident Evil: The Final Chapter Movie Review". Digital Trends. January 27, 2017. ^ "[Review] Resident Evil: The Final Chapter". Bloody Disgusting. January 27, 2017. ^ "Review: 'Resident Evil: The Final Chapter' Is A Disappointing Series Finale". Forbes. January 27, 2017. ^ Zwecker, Bill (January 26, 2017). "Like the zombies, 'Resident Evil' finale keeps moving forward". Chicago Sun-Times. Retrieved January 27, 2017. ^ Hipes, Patrick (May 12, 2017). "Golden Trailer Awards Nominees: Warner Bros & 'Lego Batman' Lead Pack". Deadline Hollywood. This page was last edited on 16 April 2019, at 23:31 (UTC).